Oh no, I want to keep arguing. But can someone else hold the fort for a bit? 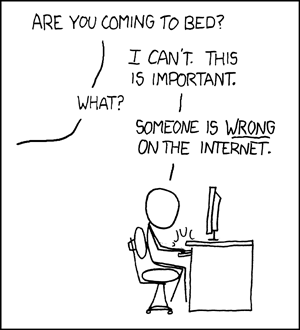 Tired of maintaining that argument online? Get someone's help! Over-baked by Chinese chat bots already. Is this a one or five minute argument ? Neither, because you haven't paid yet. Yes I have, I just gave you $20 USD ! I'm sorry, not to thow us off on a tangent, but you'll need a cosin-er. I'd prefer to follow the better arc angles of our nature. Oh dear, trigonometry puns ... why do you feel the need to be so obtuse ? Ah, would that be the Lost Chord ... ? This just doesnt add up. Can't you people act normal ? Yes, but how many actually are irrational ? Are those real numbers, or did you just make them up ? Have you any proof that they aren't imaginary ? Whatever fraction it is, your assertion is in poor taste; in fact, it's downright vulgar. Is there a risk that this idea could spawn a descendant called Internatroll Rescue ? As a traveling salesman, I find these attempts to Escher in a new age lacking in symmetry. The construction plans have changed from aesthetically pleasing to an age before cave painting had a surplus energy budget. Any idea predicated on Escher's designs is bound to fall flat.